The MHS Choir Boosters are holding a fundraiser at Boonies TONIGHT, May 9th. 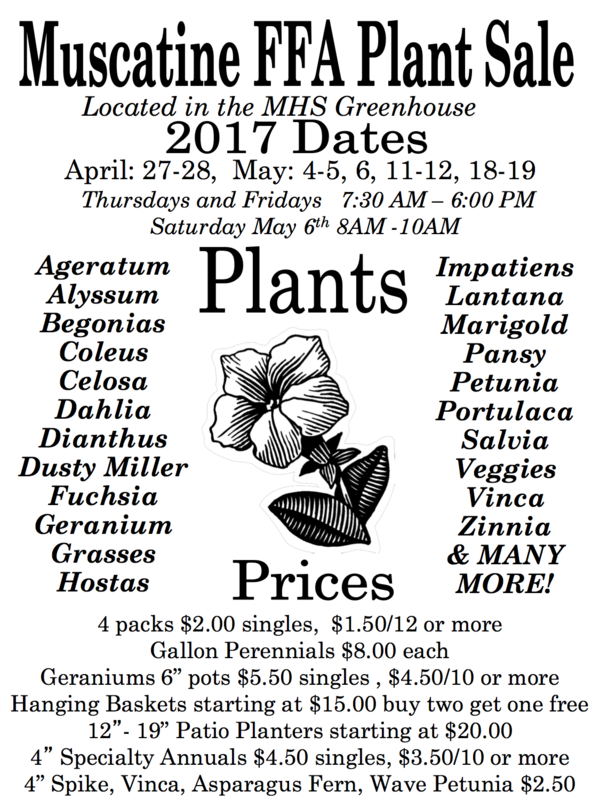 20% of the sales go towards support the MHS choirs. If you were planning to go to the MHS Band concert tonight, you can still stop in before or after the concert as the fundraiser goes from 5pm until close. 3rd Annual Muskie Baseball Hit-a-Thon – Please come out and join the Muscatine High School baseball program this Friday, May 12th at 5pm for the 3rd Annual Muskie Baseball Hit-A-Thon. All players in the program will be introduced and then they will participate in a Homerun Derby Contest. Fans will also have the opportunity to dunk our new Athletic Director Mike Morgan as well as the Muskies Head Football Coach Jake Mueller. There will also be 35 raffle items ranging from autographed baseball, pictures, and a certificate that will give one lucky winner a burrito for a year from Mami’s Authentic. Food will be provided by Hy-Vee grill. Admission is FREE. Yearbooks will be distributed starting May 11th at 1:00 pm in the Auditorium. Miss Brown will call down all seniors who ordered a yearbook first, followed by juniors, sophomores, and then freshmen. You need to wait until you are called to come and get your yearbook. If you cannot be there that day, the books will be in the Attendance Center starting Friday morning at 7:45. If you didn’t order a yearbook, but would like to buy one, they will be available starting May 12th at 7:45 am in the Attendance Center on a first come, first serve basis for $56.Please email me at katie.brown@mcsdonline.org if you have any questions. Boy’s Cross Country (XC) – There will be a meeting for all boys interested in cross-country in the fall. Summer training begins this summer. Please come to an informational meeting Monday, May 22nd in Mr. Foxen’s room 11-033 (first floor new wing) 1st part of lunch 12:00 PM. If you have questions please see Mr. Foxen. Hunger Banquet – May 16th 7-8:30 pm What does Invisible Poverty Look Like? Did you know that 50% of people make less than $2000 a year? Did you know that 1 in 9 people didn’t eat breakfast this morning? If you want to know more, a Hunger Banquet will be held on May 16th from 7:00pm to 8:30pm in the cafeteria to teach the way that poverty and hunger impact Muscatine and the rest of the world. Click here to sign up. The three of them—a twelve-year-old boy, his older brother, their father—have won the war: the father’s term for his bitter divorce and custody battle. They leave their Kansas home and drive through the night to Albuquerque, eager to begin again, united by the thrilling possibility of carving out a new life together. The boys go to school, join basketball teams, make friends. Meanwhile their father works from home, smoking cheap cigars to hide another smell. But soon the little missteps—the dead-eyed absentmindedness, the late night noises, the comings and goings of increasingly odd characters—become worrisome, and the boys find themselves watching their father change, grow erratic, then dangerous. Check out (or hold) a copy with the library staff today! Seniors – All library books and materials are due TODAY, May 9th. If you need to keep a book longer for a class assignment, please contact Mrs. Keltner. Also, a reminder that all library fines need to be taken care of before graduation. Freshman-Juniors – All library books and materials are due by Monday, May 22nd. If you need to keep a book longer for a class assignment, please contact Mrs. Keltner. MHS Bands would like to invite everyone to the final concert of the year – Tuesday, May 9th, at 7 pm in the MHS Auditorium. $4/adult, $2/student, $10/family. All passes accepted. Come enjoy great music and wish our seniors good luck! MHS Orchestras would like to invite everyone to the final concert of the year – Friday, May 12th, at 7 pm in the MHS Auditorium. $4/adult, $2/student, $10/family. All passes accepted. Come enjoy great music and wish our seniors good luck! Girls’ Basketball – Open gym this week is on Monday from 5:30-7:00 pm and Thursday from 6:30-8:00 pm in the main gym. 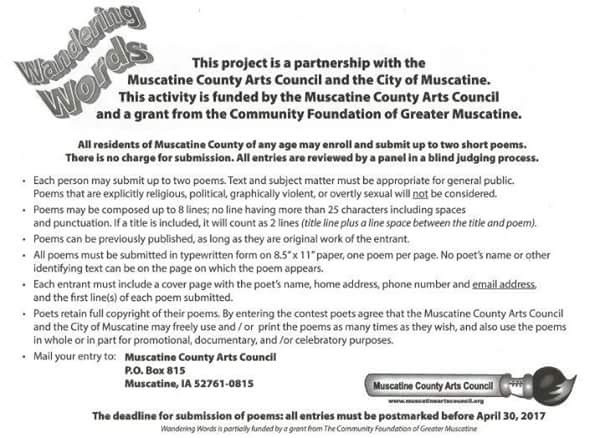 Wandering Words Poetry Contest – The contest is open to all Muscatine County residents. The deadline for submissions has been extended to May 15, 2017. 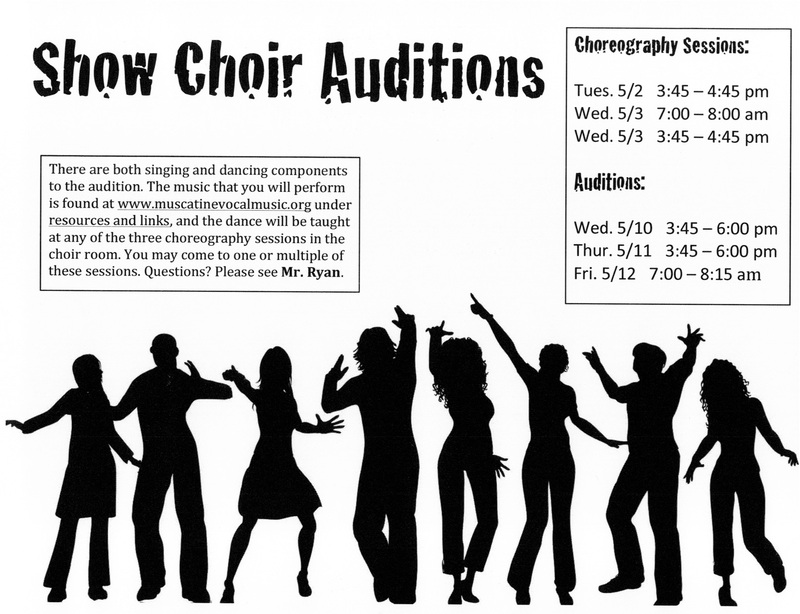 New Silver Cord Opportunities – see Silver Cord Section below. Hunger Banquet – May 16th 7-8:30 pm- MHS Cafeteria What does Invisible Poverty Look Like? : Did you know that 50% of people make less than $2000 a year? Did you know that 1 in 9 people didn’t eat breakfast this morning? If you want to know more, a Hunger Banquet will be held on May 16th from 7:00 pm to 8:30 pm in the cafeteria to teach the way that poverty and hunger impact Muscatine and the rest of the world. Muscatine Junior Tennis Tournament, July 14-16 needs volunteers for the following areas: “Court’s Cleanup Crew”, the “Check-in Table”, “First Aid-ICE-Refreshments”, and “Photographer”. The date of the actual clean-up of the courts would be Wednesday, July 12th. Looking for about 8-12 people to help clean up the courts this day. The tools to do the job I’d ask that the volunteers bring are leaf blowers, rakes, grain shovels, wheelbarrows, buckets and eye protection. Some of these items will be supplied as well. Pizza will be provided afterward for the volunteers! More volunteer opportunities for this event can be found at www.greatrivertennis.com<http://www.greatrivertennis.com. Pearl City Rehabilitation and Healthcare Center Spring Clean Up is looking for 4-5 volunteers on a Saturday or Sunday for 3-4 hours. Date to be set when 4-5 interested students have responded. If interested, please contact Jeff Cooper at (239) 994-3475.